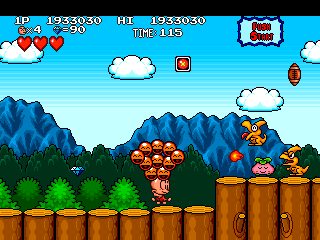 Anybody who was an avid gamer during the era of 16-bit home consoles should have at least heard of Bonk, who appeared in a few platform games for NEC's TurboGrafx-16 / PC Engine console (and later some other ports), he even became their "mascot" for a while. Lesser known however is the fact that he starred in an arcade release a few years later, but it seems to have been released only in Japan. Last edited by BBH on Tue Oct 10, 2006 9:24 pm, edited 1 time in total. My sample junk... will improve soon! Here's a sample junk leechfest. Technique ought to be banned. Quit at 4.06 million, as I was bored. Again, Thursday is my 1st play day! Ouch! By the way, very good game for this round! okay, for this tournament (doesn't necessarily have to be a MARP special rule, but...), using this "leech" tactic on bosses is forbidden. If you run out of time during a regular level, or you run out of time before you kill a boss, fine... but letting time run out after you've killed a boss WILL NOT BE ALLOWED. Even if you were trying and unintentionally had time run out before you could reach the goal. The time limit is quite generous on the bosses so I would hope that everyone would be able to kill a boss within the limit anyway. MARP's been fine the last couple of hours here. ZTNet, in general, was rather dodgy last night. Not that that's something new. Also note that he did upload the score to MARP some 6 or so hours ago. destructor wrote: Sunday 8 oct 10:58.. I will be happy if I will play with you Nanni. But remember that zylquin is good player. I don't know where is gastrainga. If I will have more time today and tommorow gstrain can prepare for 14-15 mln score for sure. I don't know for 100% but I notice that items from plants aren't randomly. Maybe in game is something like as in Knight of the Round or other 'special random system'. destructor wrote: I will be happy if I will play with you Nanni. But remember that zylquin is good player. I wish I could be giving you a better fight Nanni because you are a great player and would fight back well, but you should be ok this round. No excuses, I'm just overwhelmed by this game. BDF, where are you? I am disappointed you have not uploaded a score yet, nor have you said anything on these forums.